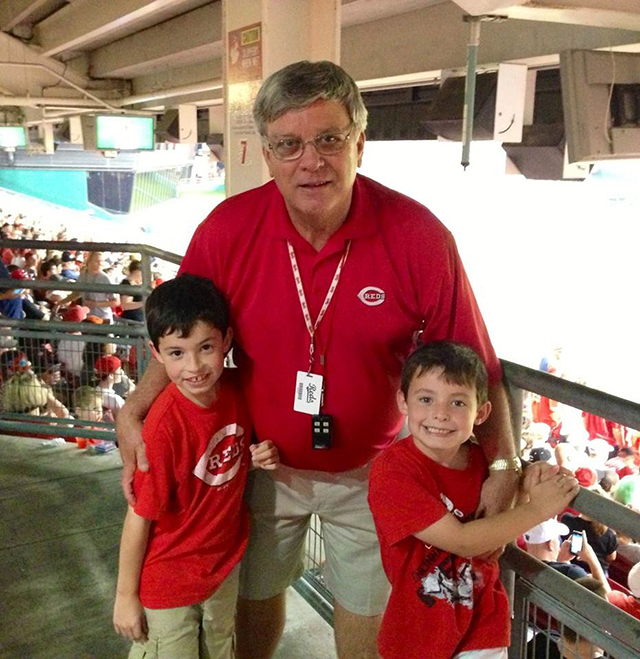 Former AEP employee and current Cincinnati Reds usher Larry Robinson (center) enjoys a day at the Great American Ballpark with his two grandsons Sammy (left) and Brady. Larry Robinson spent a lot of time making sure everyone got to the right place at the right time during his 28-year AEP career, so it was only fitting that he continued that activity – and even kicked it up a notch – during his retirement. Robinson, who retired in 2002 as a process centering coordinator at Philip Sporn Plant, spent most of his career at Gavin Plant in maintenance and training and also signed on as a facilitator for the AEP Institute, passing along his knowledge to other employees after he left the active work force. “I met a lot of employees while with the Institute,” he said. In 2007, Robinson and his wife, Laura, decided to move from Belpre, Ohio, to Cincinnati, Ohio, to be close to their daughter, Amy, and their two grandsons. Robinson decided he had nothing to lose, so he took a shot. That was seven years ago, and Robinson is now in his sixth year of “working” as an usher for the Reds. He said his primary duties include checking tickets, seating guests in the correct seats for Reds’ home games and trying to ensure that everyone has an enjoyable visit to the ballpark in a family atmosphere. So were the Reds his hometown heroes growing up? Robinson said even though the ushers are close to a lot of the players and coaches, there isn’t much time to pal around with them. But what about catching foul balls or home run balls? Robinson said he struck up a nice conversation with the man, and he noticed that as the Angels’ manager and players entered the dugout, they all waved and said hello to him. So does Robinson trek to the park for every Reds home game over six months of the season?